“Making Waves” is an extensive look at the work of Tawaraya Sotatsu, an artisan and craftsman who worked in Edo (Tokyo) from 1620 through 1640, a turbulent time in Japan’s history. He emerges from obscurity in 1620 when he repairs a Buddhist Sutra scroll in Hiroshima. In Edo, he establishes his workshop, gains connections with the aristocracy and the Buddhist priests, and produces works of art that are now priceless. Then he fades away in the 1630s, leaving others to carry on, and follow, his work. 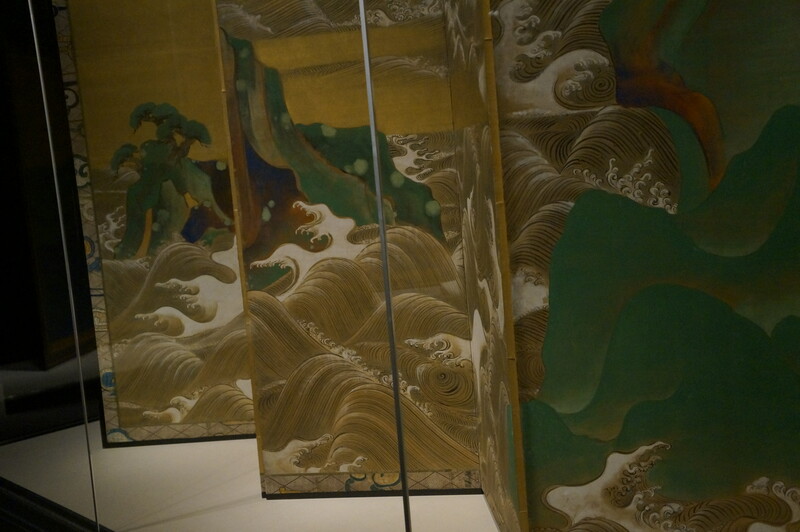 The opening screen of the Sackler show is “Waves at Matsushima.” It was “likely created” in 1620, said Ulak. Originally called “Boiling waters and rocks,” it was created for a rich merchant who donated it to a Zen temple. The first floor of the exhibit has hand-created books, Noh (Japanese theater) librettos, ink stamps and calligraphy with his noted collaborator Honami Koetsu. There are hanging scrolls, hand scrolls, and poetry. One pair of scrolls are from a multi-print set that are “all dated to the 11th day of the 11th month of the 11th year (1606)” when a Imperial Regent (the Prime Minister) retired. “Probably these were created in his honor,” said Ulak. 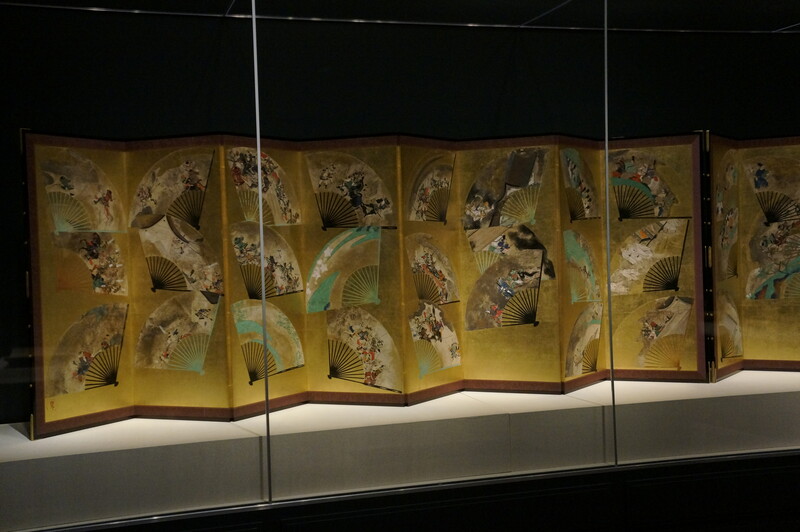 Among the many treasures, besides the opening “Making Waves” screen, is a six-panel folding screen which was commissioned by the Emperor called “Screen with Scattered Fans.” It is on loan from the Imperial Household in Tokyo. Why is it so very important? All the fans. Thus the screens gather together centuries of history that were owned by the aristocracy and made available for the Emperor’s enjoyment. Now five hundred years later, anyone who visits the Sackler exhibit can enjoy them. The lower level of the exhibit is separated into several different collections. 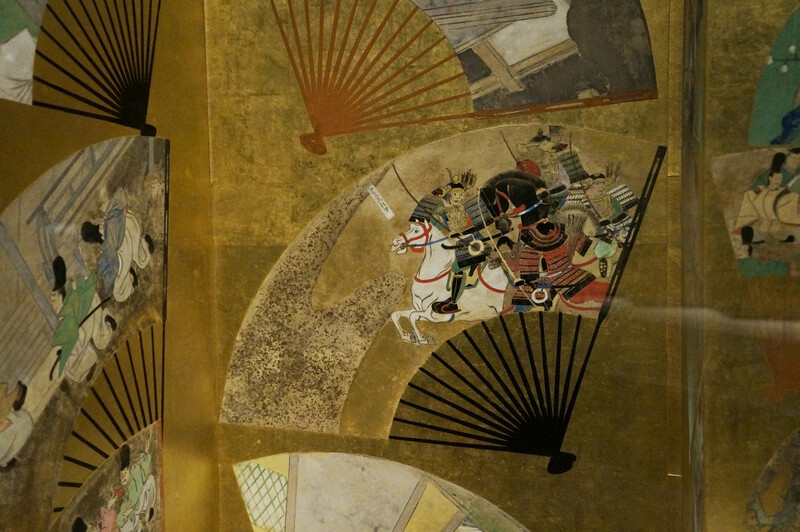 The first few are ink paintings done by Sotatsu and his workshop, including the magnificent monochromatic painting of a dragon dodging in and out of the clouds is part of the Freer Gallery of Art’s own collection. Then comes a section of art inspired by Sotatsu. Sotatsu’s workshop kept producing works in his style as shown in several hanging scrolls and floral screens. Artists through the 1800s continued to be inspired by his work. And this is where you find the cats. A two panel screen “Whose Sleeves?” has four cats. 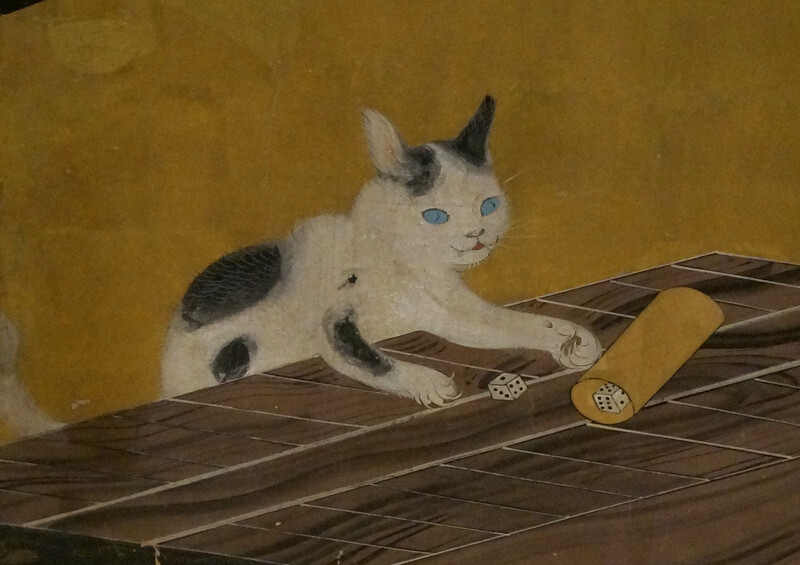 One of them is playing with dice. At the staircase between the upper and lower galleries, the Sackler has also provided a table where visiting children and adults can make their own fans. The final room has a fascinating new initiative for spreading art to those who can’t get to Washington. Through a collaboration between Canon Camera and the Kyoto Cultural Association, “one-of-a-kind facsimiles” of the Freer Gallery’s art are being made and “used in a variety of schools and education in Japan,” said Ulak. “Sotatsu: Waves at Matsushima”, Oct. 24-Jan. 31, 2016. The Arthur M. Sackler Museum, Washington D.C.
Amazon.com link for Sotatsu by James Ulak. 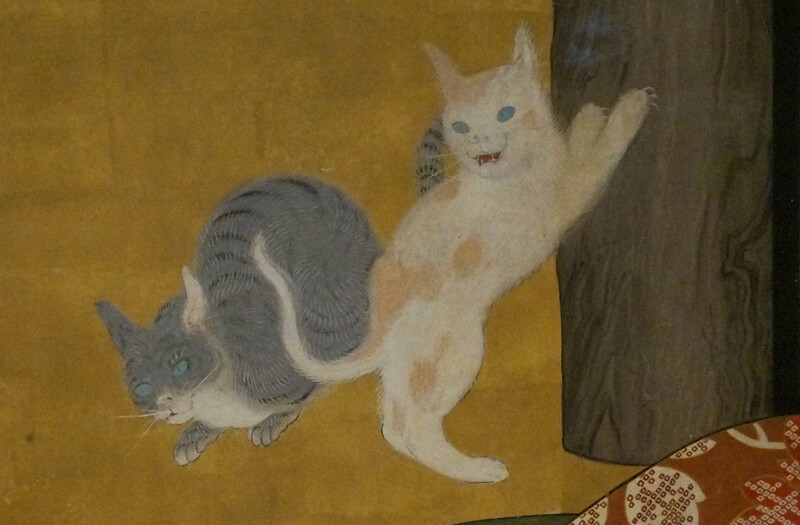 This entry was posted in History, Uncategorized and tagged Asian Art, Fans, history, Japan, Sackler, Sotatsu. Bookmark the permalink.